My pre-order has been in for weeks (at my local independent bookstore, of course.) Tomorrow I shall swoop down and scoop up my copy of Two Years Eight Months and Twenty-Eight Nights. It is Salman Rushdie’s first new novel in seven years. Everything else I’m currently reading will start gathering dust. I encountered Rushdie in the same way many others did: I bought a copy of The Satanic Verses purely to show solidarity against censorship, after Iranian clerics ordered that Rushdie be murdered for the “blasphemy” it contained. It sat on my shelf unread for years. Once I finally read it, I began a reading marathon of everything he ever wrote. How to explain his magic? Plot summaries wouldn’t do it, even if I could recall every twist and turn of the fantastic events that befall his characters…his myriad characters, his worldsful of characters, the armies of imagined people who march, parasang upon parasang, the length and breadth of the Rushdie universes. The universes themselves are miracles. These are not alternate worlds like Middle Earth or Westeros. They contain, for example, the India we all know, the England, the United States. They also contain impossible events (two men survive a fall from a bombed plane miles in the air), strange powers (e.g., telepathy and witchcraft), eerie coincidences (an Indian songwriter anticipates all Elvis’s greatest hits.) Real-world politics, popular culture, “high” culture – usually taken down a peg – toss these very-not-ordinary people hither and yon. Some of them survive and even triumph, in a way. Others are ground to bits by the entirely ordinary evil and stupidity that permeate every human institution. 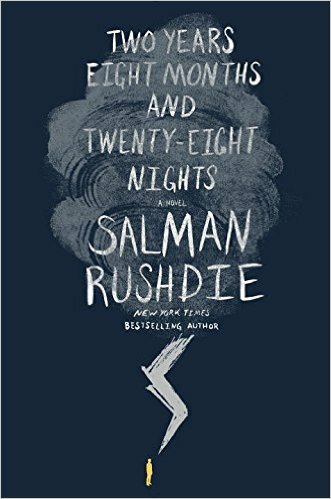 But somehow, Rushdie’s Children defeat even defeat itself, simply by being more genuine – realer – than the real-world institutions that destroy them. “In Amsterdam in his middle twenties Malik Solanka – in the city to speak on religion and politics at a left-leaning institute funded by Fabergé money – visited the Rijksmuseum and was entranced by that great treasure-trove’s displays of meticulously period-furnished dollhouses, those unique descriptions of the interior life of Holland down the ages. They were open-fronted, as if bombs had knocked away their façades; or like little theatres, which he completed by being there…. And how about that “left-leaning institute funded by Fabergé money”? So tomorrow I shall vanish from the world for some days, to read Rushdie and do nothing else. I hope my friends will speculate that something very odd may have happened to me. After all, I understand that in Two Years Eight Months and Twenty-Eight Nights, genies rise up from the sea bed in New York Harbor and eat the Staten Island ferry. Posted on September 7, 2015, in Good Reads, Heidi Wilson, writing and tagged Fury, magical realism, Salman Rushdie, Satanic Verses, Two Years Eight Months and Twenty-Eight Nights. Bookmark the permalink. 3 Comments. Have to admit I haven’t always understood the Rushdie books that I have read but they have always sucked me in until I’ve finished reading them–dust and all…. It is a magic lamp! Read it at once, and when you’re done, I’ll lend you Two Years…. Reading your post was like polishing up that old magic lamp I stuck on a shelf years ago and having it turn into Satanic Verses. The book itself needs dusting off. Will it then turn back into a magic lamp?